I plan weeks or even months ahead for low tide explorations on the outer shores. The lowest tides, those below 2.0′ below mean lower low water on my home beaches, reveal rocks and sand we hardly ever get to see. On the exposed outer coast, this zone is rarely examined closely because it is usually submerged which keeps shore-bound observers at a distance (and distracted, with at least one eye on the surf!) and the battering waves keep divers away. When you get a chance to observe the lowest intertidal rocks and sand, you want to take it. Because low tide habitats are so seldom accessible, we hardly have time to acquaint ourselves with even the common residents, let alone the uncommon ones. This explains a lot about the allure of the low tides. Getting up close with the nudibranch, Hermissenda crassicornis, or a slender kelp crab, Pugettia gracilis, is a treat; and what about the coralline you’ve noticed for years but never spent much quality time with? 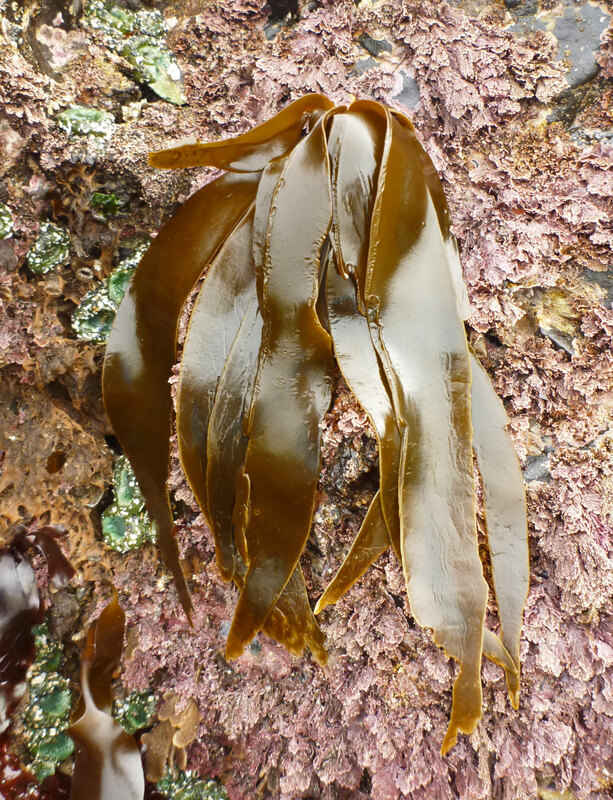 Or that kelp you thought would be so easy to identify; the one that turned out to be so frustrating? These are the rewards offered up by low tides. I’ve written several posts about low tides. A few examples are, Tracks, Trails, and Shows; Seaweeds in the Sand; Sea Stars and Sand Dollars; and Finding Yourself in the Infralittoral Fringe. For the reasons listed above, and a few others I’ll jot down someday, I’m a sucker for the lower intertidal. It is colorful, diverse, and teeming to the point of overflowing. A fascination with this rarely exposed zone and it’s communities could easily keep one from attending to the higher shore; and in my case, I confess it has. Things are about to change. It’s time to give some love to the highest intertidal reaches. 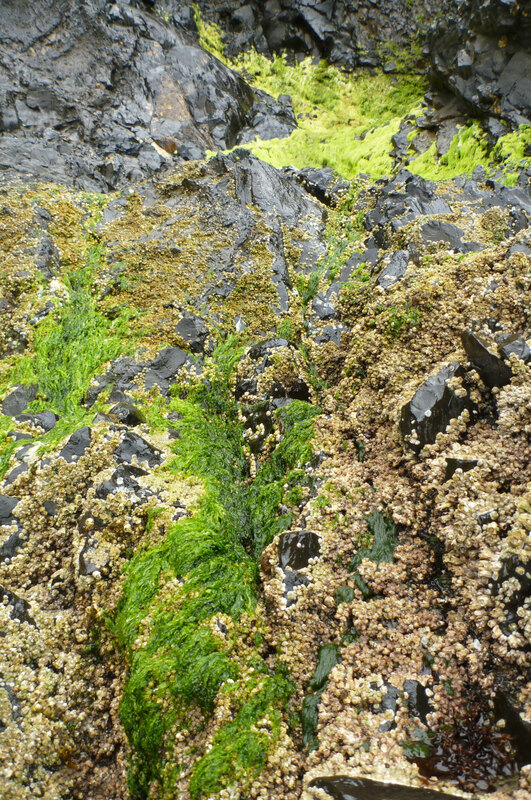 The photo above shows the rocky intertidal from very low to very high, and I’ve added a few landmarks to orient by. This well-situated rock is occupied by a nice spread of intertidal communities. These communities occur, as you can see, in more or less vertical bands. Mean lower low water, or 0.0′ is a great landmark. Tides below 0.0′ are called minus tides and that’s when most of the serious tidepooling occurs. When I say I’m going to give some love to the highest intertidal reaches, I’m referring to the area wetted by sea spray and big waves, and submerged occasionally by tides above mean higher high water, which on my home beaches, occurs at about the seven to eight foot mark. Intertidal authorities refer to this upper zone by a variety of names including zone 1, the high intertidal, or supralittoral fringe. This high in the intertidal, there can be a lot open ground, and you’re not going to see a ton of species; dull coloration is the norm for the few common large ones. In the highest reaches of the supralittoral fringe, the commonly seen animals are small barnacles, limpets, and snails. Under some conditions, algae can be conspicuous. The acorn barnacles, Balanus glandula, on this rock seem to be inching skyward up the crevices. A little lower, they can form an almost continuous cover. being entirely superfluous and illogical for a belt of marine organisms…it has, historically at least, a supratidal meaning. Perhaps so, but language is not always logical, and we may soon have to adjust ourselves to discussions of the “geology” of the moon. In any event, supralittoral is a universally used term, and if we wish to be logical, we should also dispense with subtidal. As for historical meanings, one should by this token restrict a certain word referring to arches to architecture and ignore what has been going on under them since Roman times. So supralittoral it is. Let’s continue exploring its upper fringes. 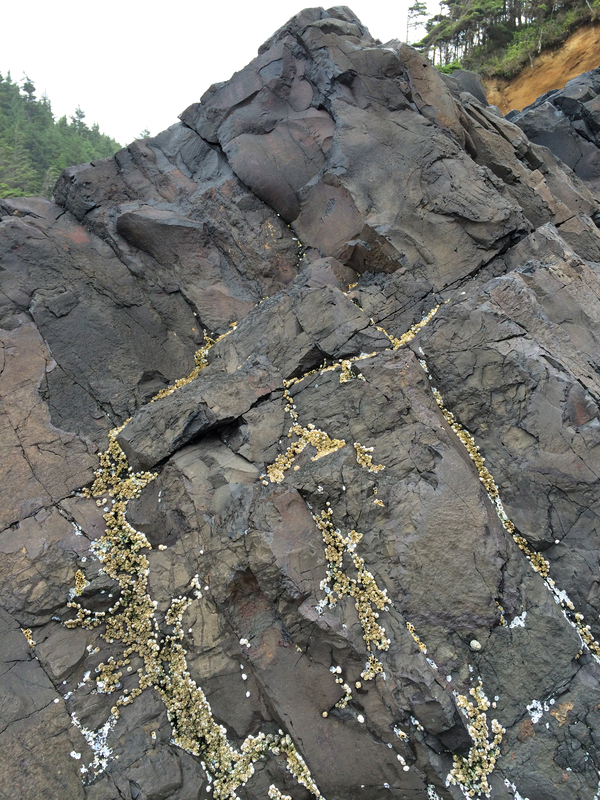 On the highest occupied rocks, count on seeing barnacles, limpets, and periwinkles. The small set of photos below features acorn barnacles, Balanus glandula, and ribbed limpets, Lottia digitallis, but you’ll see a few checkered periwinkles, Littorina scutulata, in a couple of the images. You will also see lots of tiny white specks; those are baby barnacles. Spring, 2014 must have seen seas full of larvae and good conditions for settling. Contesting and sometimes inching higher than the species mentioned above, especially at freshwater seeps, is Ulva intestinalis. A little lower, but not much, and becoming even more prevalent in what people variously refer to as zone 2, the upper intertidal, or the upper midlittoral, you’ll start to see a new snail, the northern striped dogwinkle, Nucella ostrina. The next set of photos shows a few different versions of this polymorphic predator. You’ll also see, in a couple of the photos, some incidental little brown barnacles, Chathamalus dalli. You can find C. dalli in the supralittoral fringe, but I find a greater expression of little browns lower in the intertidal. That’s a reasonable start on the rocky intertidal; what about the highest levels on the sandy beaches? I think a good starting point is the California beach hopper, Megalorchestia californiana. 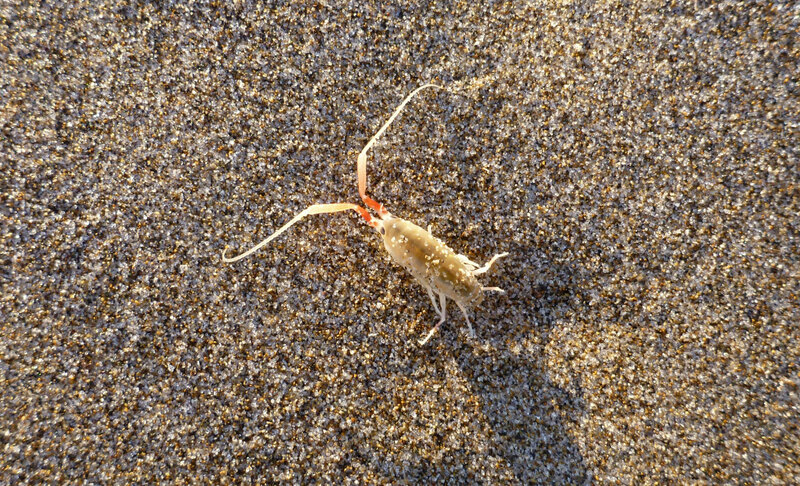 If you want to learn a little more about beach hoppers, have a look at my post, California beach hopper, Megalorchestia californiana. This is just a beginning; there are plenty of organisms and features of the infralittoral fringe I haven’t mentioned or given anywhere near the attention they deserve. I’d love to spend more time with periwinkles, Littorina and the rock louse, Ligia; and on the sandy beaches, the little beach hoppers and ferocious rove beetles, Thinopinus pictus, deserve mention too. I should also mention that I am not an expert on the intertidal or its communities. The nomenclature I have adopted for the zones and it’s inhabitants may not be that most in use by intertidal researchers; and my identification of some of the species featured in this post could be erroneous. I’ve used my own judgment, consulting the references cited below, but if you detect some identification mistakes or can suggest a better way of describing the zones, I hope you’ll let me know. Dayton, P. K. 1971. 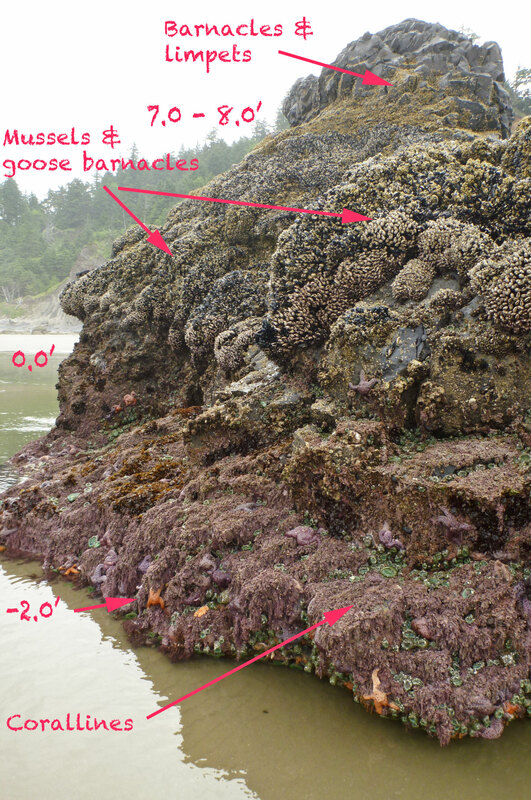 Competition, disturbance, and community organization: the provision and subsequent utilization of space in a rocky intertidal community. Ecological Monographs, 41 (4): 351-389.